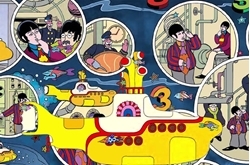 Watch The Trailer For The Beatles 'Yellow Submarine' Graphic Novel . Beatles Radio: The Beatles, Solos, Covers, Birthdays, News The Fab 4 and More! Fifty years after The Beatles' psychedelic animated movie classic, Yellow Submarine, hit theaters, Titan Comics is prepping a graphic novel take on the trippy adventure. In this Apple-approved version, Simpsons comics artist Bill Morrison re-tells the story of the cheerful, music-loving underwater world Pepperland's invasion by the marauding, music-hating Blue Meanies, who turn the citizens into statues by shooting arrows that drop green apples on their heads while imprisoning Pepperland's guardians, Sgt. Pepper's Lonely Hearts Club Band, in a soundproof globe. Just before he's captured, Pepperland's Lord Mayor sends Old Fred off in the Yellow Submarine to get help in Liverpool, where he corrals Ringo and his pals, John, George and Paul, to travel back and battle the Meanies using love and music.